SAN DIEGO, Calif. — Petty Officer 1st Class Adam Yetter, a Navy sailor for 17 years, works a second job as a security guard and donates blood plasma twice a week to help make ends meet for his family. Deployed seven times during his military career, including an extended 19-month tour to Iraq, Yetter squeezes in family time with his three young boys and his wife in-between jobs. To save money, the Yetters recently moved off base into a two-bedroom apartment they share with another sailor and his two sons, who stay there part time. Despite their penny-pinching efforts, the Yetters have been living paycheck-to-paycheck for many years as they work to get rid of debt accumulated over everyday expenses like car repairs and gas and the costs of caring for an autistic son. They often visit food pantries to keep their kitchen stocked. “We’re doing everything we can possibly think to be doing and we're barely making it,” said Adam’s wife, Lindsey, 36. (Adam declined comment). She accesses many local pantries, uses money-saving strategies and has met with a financial adviser to get the family budget into the black, but they’re stuck, she said. “You're robbing Peter to pay Paul most of the time,” said Yetter, a teaching assistant at a preschool. Yetter’s family is among the 620,000 households that include at least one soldier, reservist or guardsman – or 25 percent of the nation’s total active duty and reserve personnel – that are seeking aid from food pantries and other charitable programs across the country, according to a rare inquiry about the food insecurity of troops and veterans conducted by Feeding America, a hunger relief charity, that will be released Monday. Another 2.37 million households including veterans receive assistance from food pantries that are part of Feeding America's network (this figure doesn't include households where both a former and current service member reside). The help is sought for various reasons, experts say: For active duty, pressures include low pay, poor financial planning by junior soldiers, the difficulty for spouses to hold steady jobs amid base transfers and deployments, and the higher costs of living in some states. For veterans, the triggers are the transition to the civilian world, and, for some, living off low disability pay or retirement funds. Both groups were hit by the Great Recession, too. 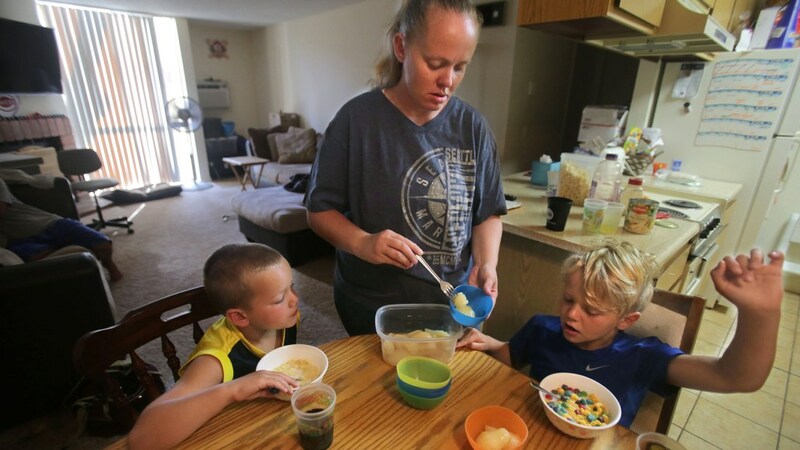 “We’ve heard for the last several years from our food banks that there’s a growing need among military families for food assistance,” said Maura Daly, a Feeding America spokeswoman. Though the organization “found the results to be incredibly disheartening” it also will give Feeding America the opportunity “to partner with military organizations on the ground to help ensure that we are better meeting their needs,” she added. Spikes in food aid sought by active duty service members, reservists, guardsmen and veterans emerged in states with large military bases, like in Delaware, California, Texas, Colorado, Georgia, Washington and Virginia, according to Feeding America data from its "Hunger in America 2014" report, a national study it runs every four years. Other surges came in states where a lot of people join the military, like Iowa, and then return home after being discharged. More than 60,000 clients of the organization’s network and 32,000 of its partner agencies participated in the survey. Operation Homefront, a nonprofit focusing on the lowest-paid enlisted service members, wounded warriors and their families, said requests for food assistance from people they serve tripled starting in 2009 and have only slightly receded since then. Adding to the financial strain for military families, the Defense Department this year issued its lowest pay raise – 1 percent - in 50 years, according to the Military Officers Association of America, a nonpartisan nonprofit focused on military personnel matters, and it will seek the same level from Congress through 2017. Limiting the pay increase came after Congress in 2000 passed a law to redress the salary gap between civilians and the military, which was then at 13.5 percent, the association said. The new pay cap hurts retention and readiness, particularly impacting young military families already living on tight budgets, said Army Col. Mike Barron (Ret. ), the association’s deputy director of government relations. “It’s going to cause them (soldiers) to not be as focused on their job at hand and a lot of the jobs that we have, lives depend on them being focused,” he said. The financial hardships translate into “more stress on the force, more stress on the service member, more stress on their family,” he added. The DOD said in its FY2015 budget request that the rate of growth in military pay and benefits over the last decade had “more than closed compensation gaps” but it couldn’t sustain that pace in the current constrained fiscal environment. A 2012 Pentagon study found that pay for enlisted soldiers, who have the lowest salaries in the military, exceeded wages paid to 90 percent of civilians with similar qualifications. For enlisted soldiers, pay starts at about $18,000 for new recruits and can reach upward of $65,000 for some who log more than 18 years in the military, according to the DOD’s pay grade for 2014. While they also get tax-free allowances for housing, food and clothing, many families said they were still struggling to get by. In interviews with veterans and active duty families, many told NBC they had various schemes for trying to stretch their dollars or raise extra cash: recycling, couponing, visiting multiple food pantries and homeless shelters for emergency food like milk for their children, buying groceries from dollar stores, delaying payment of utility bills, and signing up for food stamps and WIC – the nutrition program for women, infants and children. Some 2 percent of troops and 7 percent of veterans received food stamps from 2009 to 2012, according to the U.S. Census Bureau’s American Community Survey. Similar data for WIC wasn’t available. 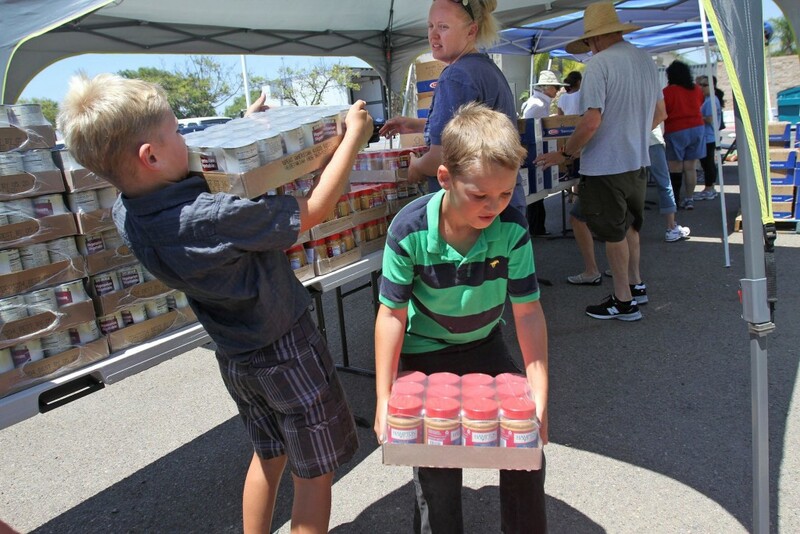 Food banks have in the last few years responded to the demand, with pantries holding monthly distributions on military bases or nearby, like at the Army’s Fort Drum in upstate New York, Marine Corps’ Camp Pendleton in Southern California and at naval housing in San Diego. 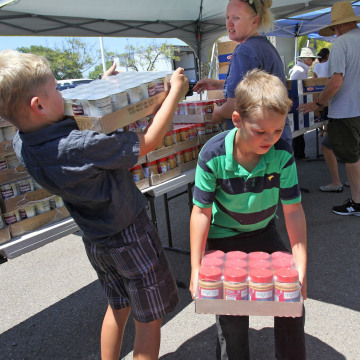 Some food pantries have opened in schools in military neighborhoods. In late July, 112 families – some with children in strollers and pulling wagons to carry their food – formed a line snaking around two buildings at Camp Pendleton on a hot Sunday in the arid, coastal mountain climate. The pantry, run by JFS, provided games for the kids, massages for the parents and let individuals choose what they wanted in a bid to remove the stigma of standing in a food line. “It's hard to know that my husband is fighting for his country and he's working long days and long hours and we still have to struggle to keep food on the table and gas in our cars,” said Shirley Starkey, 45, whose husband, a Marine of 11 years and a sergeant, has been deployed twice to Afghanistan and once to Iraq. Starkey’s 18-year-old son left for Marine boot camp in May, but the couple is raising their six-year-old grandchild. They started having difficulty making ends meet when they moved from Camp Lejeune in North Carolina four years ago, where they had savings, to the more expensive northern San Diego County, where they can’t get ahead financially. The stories are similar for veterans, though they are typically wrestling with the switch to civilian life and, for many, living with disabilities. A 2012 survey of nearly 1,000 post 9/11-era veterans in Minnesota found that 27 percent were experiencing food insecurity, with about half of them in more dire straits. Both numbers were nearly double that of the national average, according to the survey by the University of Minnesota and the VA Health Care System in Minneapolis. There had been no published research on food security among this group of veterans until the survey and the numbers were “surprising,” said lead author, Rachel Widome, assistant professor in the university’s Division of Epidemiology & Community Health and an investigator at the Minneapolis VA.
“I think it's important for those of us that interact with veterans to be aware that even if you're talking to them and working on other issues, they might also have another hidden struggle that's not received very much attention and can be really difficult for people to talk about,” she said. The food-insecure veterans had one or more of the following characteristics: they tended to be younger (like their active duty counterparts), have lower incomes, were unemployed, single and had more children at home than their peers who weren’t having food challenges. When NBC asked the U.S. Department of Veterans Affairs if it gave food assistance to former service members, it said it didn’t provide direct food aid to vets but noted they would most likely receive that help from the VA’s local or state partners. Navy veteran Mike Hernandez, 37, said he grappled with the transition to post-military life after leaving the service in 2006. He had $12,000 saved for the change, but that wouldn’t get him far as the country slid into recession the following year. Hernandez worked in San Antonio as a day laborer to get by, and one time, he and his family had to get groceries from his parents and sister because he didn’t have any money to buy food. His work in the Navy as an Aviation Systems Warfare Operator – in which he deployed several times - didn’t translate well in the civilian world. Hernandez got a security guard post in 2008. That, plus his disability check from the Veterans Administration for post-traumatic stress disorder, weren’t enough – still aren’t -- to make ends meet so he, his wife and their three daughters (ages 12, 9 and 18 months) went to a food pantry. The family qualified for food stamps but stopped using them when their situation improved because, Hernandez said, they didn’t want the stigma associated with collecting them. But they now need food help again and he doesn’t have the money to pay the water bill until his next paycheck. That’s the situation the Yetters are facing. Adam Yetter earns about $75,000 annually (before taxes), including the allowances for housing and food. A family with two young kids – not three like the Yetters have - living in San Diego needs $85,000, or $10,000 more than Adam earns, to make ends meet in the area, according to a 2014 study by the Center on Policy Initiatives. Lindsey Yetter said she has done paper routes, worked night shifts while pregnant, and babysat to plug their financial holes. Amid the hardships, Yetter said she also went to pantries in order to help provide her boys healthy fruits and vegetables, which can be prohibitively expensive for people on limited incomes. The family volunteers at one of the pantries, a way for the boys to learn about giving back, too, she said. Yetter said they’re grateful for the benefits they have received from the Navy, like her husband’s education, yet wishes they didn’t have to struggle so much. The family stands to lose about $1,600 this year from the DOD pay cap, according to Barron of the officers association, but they’re hoping to save money by moving into the apartment and to pay off their debt.